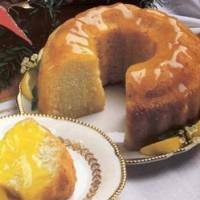 Serve this flavorful and moist lemon pound cake with the tangy and light lemon sauce. So tasty and very refreshing! Preheat oven to 325° F (160° C). Grease a 16-cup (3 1/2 to 4 liter) tube or bundt pan. Dust pan with cake flour; tap out excess flour. Sift flour, baking soda and salt into medium bowl. Using electric mixer, beat butter in large bowl at medium speed until fluffy. Gradually add sugar and beat 5 minutes. Add eggs 1 at a time, beating just until combined after each addition. Beat in lemon juice and zest. Using rubber spatula, mix in dry ingredients. Mix in sour cream. Transfer batter to prepared pan. Carefully turn cake right side up on rack and cool completely. Once pound cake has cooled, drizzle with cooled Lemon Sauce (recipe follows). Note: Pound cake can be prepared 2 days ahead. Wrap in foil and let stand at room temperature. Beat eggs in a large bowl until foamy; add the sugar in a stream and continue beating mixture for 3 minutes or until thick and pale. Transfer the egg mixture to the top of a double boiler. Whisk together the egg mixture, zest and juice, water and a pinch of salt. Set bowl over boiling water and whisk gently for 10 minutes, cooking the mixture until it thickens around the edge. Transfer mixture to a bowl to cool. Cover and refrigerate. Will keep in the refrigerator for 3 days. Makes 2 cups. This recipe is excellent, I made it for my brother-in-law's birthday and everybody loved it. It's most amazing and a hit every time I make it. Fresh bio ingredients makes such a big different and the sauce... to die for. Made this pound cake for a church function.Very moist, dense, and the fresh lemon flavor doesn't lack or disappoint. I would give this five stars, but I felt it was too tart, and it never really thickened to the consistency I desired and expected. I assumed the lemon sauce would be akin to a lemon curd, but despite cooking and stirring over a double boiler for 15 minutes I felt it was too runny. Finally I cooked the sauce directly on my stovetop on a medium setting (risking the chance of the eggs curdling- which the didn't) still no improvement.